Every administration takes office with the intent to improve the government’s performance, including reducing the time it takes to award contracts for the services and products the government needs for its operations. 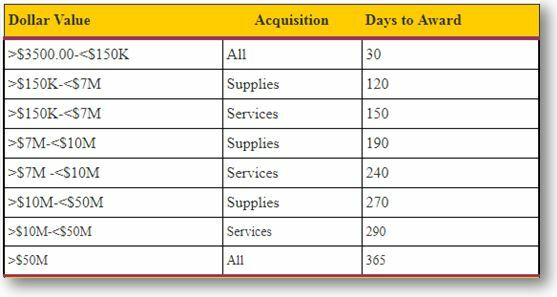 The Marine Corps uses this chart as a guideline for commercial item lead times. Nearly every administration in the past 50 years has undertaken specific steps to reduce what is commonly called Procurement Acquisition Lead Time, or PALT. In the end, though, it’s hard to find concrete evidence of success, as complaints of excessive PALT continue to plague the acquisition system and present challenges to both government and industry. What exactly is the problem? Why does it take too long to get to a signed and executable contract? Is it the time it takes to determine the government’s requirements? To translate those requirements into a statement of work (or similar description) that forms the basis for a solicitation and ultimately a contract? Is it the time for the government to solicit and evaluate bids for that work? To award the contract and get to a start date? To comply with all the procedures and reviews and reports needed along the way? And what exactly is “too long” a time for any or all of those steps?